I decided to attend the match quite late in the day so couldn't really complain too much about having to pay top whack for a ticket but being in the Gold area what could go wrong? Well, being positioned in the top tier about three rows from the back of the stadium so far from the pitch, it was not that easy to recognise many of the players for a start. Add to that I was lucky enough to have a couple of guys sitting half a dozen rows in front who were chaperoning a large group of youngsters, and for at least 30 times during the match attempted to start the dreaded Mexican Wave. Just worth mentioning that despite arriving at the ground over 30 minutes before kick-off, finding that I could not get into the stadium with my ticket, eventually to be directed to the ticket office and finding a queue of over a hundred people with only about five ticket booths manned, I eventually got to my seat after kick off. Anyway, one look at the Quins team together with (for once) plenty of talent on the bench there was at least the chance of seeing a half decent game. Well that was what was going through my mind before the game got underway. 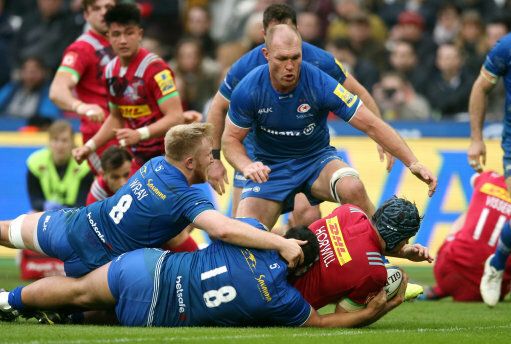 Although Quins were three points down to a Lozowski penalty within a couple of minutes they countered with a 40-metre break by Joe Marchant only for a sloppy ball being fumbled by James Horwill to hand the advantage back to Saracens. During the resulting short break in play we were treated to our first blasting of loud music, and as it was clear to the organisers we enjoyed it so much, this continued throughout the afternoon for any stoppage longer than about five seconds. A bit of kicking back and forward, a Quins line out on half way which is lost, a 30-metre break by Maitland, quick recycled ball and Quins are short of players wide out resulting in a touchdown by Sean Maitland in the corner. A fine kick by Lozowski and suddenly Saracens are ten points to the good after only 10 minutes. Typical bit of Quins play shortly after when a penalty takes them to the Saracens twenty two following something like 16 phases getting absolutely nowhere. Then to cap it all the line out throw is lost so they have to do it all over again with a grubber kick by Marchant leading to a line out on the Saracens twenty two but this time on the opposite side of the field. With 23 minutes gone Quins eventually get some reward when Saracens are penalised for straying offside allowing Catrakilis to have a shot at goal who rather worryingly requires heavy bandaging to his thigh prior to the kick. The kick is good leading to Quins first points of the afternoon. Within 4 minutes Catrakilis can line up for another penalty attempt following a lot of I am not sure what between the two packs which he slots home quite comfortably followed shortly afterwards by Him being replaced by Marcus Smith. Just as Quins seem to be slowly getting back into the game Saracens up the pace to drive into the Quins twenty-two and some non-existent Quins tackling allows Maro Itoje to run in for a score from about 15 metres out. So all of the hard work undone in seconds, and despite the conversion attempt miss, the scoreboard shows Saracens 15 Quins 6 after 31 minutes. Saracens continue to press for the remainder of the half and are awarded a penalty when Horwill is harshly penalised for playing the ball off of his feet allowing Lozowski to kick to bring the half time score to Saracens 18 Quins 6. A very lively start to the half for Quins with Marcus Smith showing off his talent to the full, first with a neat chip which Lozowski manages to take in his in goal area and clear the ball to touch, and secondly when he gets the ball again from the quickly taken line out, leaves the Saracens defence flat footed to make headway down the left flank. 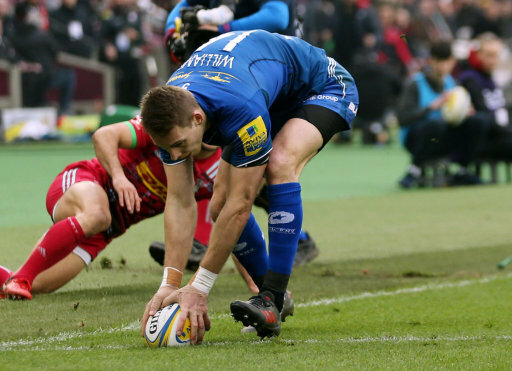 Unfortunately the subsequent chip through is too long allowing Saracens to touch the ball down in goal. 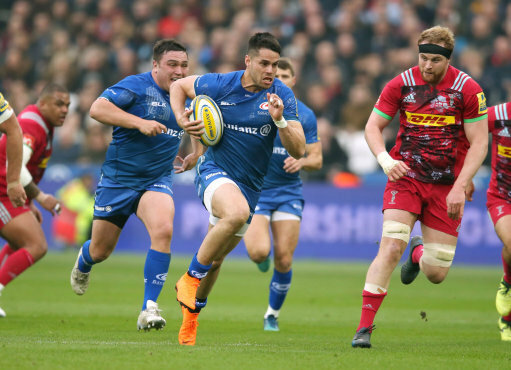 Unfortunately, the other side of Smiths game was on show a little later when following a bout of kicking from end to end he collected the ball inside the Quins twenty two and instead of making the ball safe he tried to run the ball and was swamped by the Saracens chasers. Quins retain the ball, get the ball into touch but it allows Saracens to once again threaten the Quins line but their attack breaks down when Tim Visser hacks a loose ball downfield only for Lozowski to beat him to the ball twenty metres short of the try line. Saracens spill the ball forward trying to move forward and before a scrum can be taken Saracens replace their complete front row and Lambert, Wallace and Roberts are replaced by Marler, Clifford and Saili for Quins. Quins are awarded a free kick from the scrum which is the prelude to a period of sustained pressure on Saracens which eventually leads to Horwill crossing the line for a try. Smith pulls the kick wide so with ten minutes of the half gone, Quins are back in the game. So, you don't need three guesses for working out what happened next! The game restarts, a kick by Smith is charged down, the ball goes loose with Quins eventually being penalised for holding on a few feet from their own line. 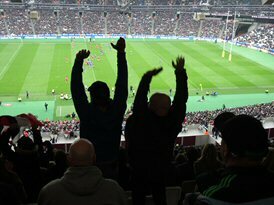 Another successful kick from Lozowski and the score moves on to Saracens 21 Quins 11. For the next 15 minutes of the game both teams upped the pace, running the ball at every opportunity with replacement Britts failing to hold on to a scoring chance out wide and a touchdown by Saili rightly disallowed as he took the ball from a forward pass. With 12 minutes to go Mike Brown fails to collect a neat chip by Danny Care into the Saracens in goal area as the ball is claimed by his opposite number Alex Goode. There is a bit of confusion when Goode moves forward for a twenty two metre drop out but is called back when referee Foley reminds him that he had called for the mark. Goode clears the ball to touch 30 metres out, Quins win their line out and mount another attack which eventually breaks down when Barrit replacement Max Malin is yellow carded for a deliberate knock on. Quins definitely have the upper hand and with less than 10 minutes on the clock are awarded a scrum 20 metres from the Saracens line which surprise surprise takes a couple of time wasting resets before Quins are awarded a penalty as they shove the Saracens pack backwards. In my view, Quins made the wrong decision at this juncture when they elected to kick for the corner; being two scores behind definitely should have taken the three points on offer to put them within losing bonus point territory. Although Horwill wins the ball Quins are penalised for crossing in the line out allowing Saracens to clear the ball to touch. Saracens take the ball and set up a rolling maul and it is inevitable that Quins are eventually penalised when Clifford is adjudged to enter the maul from the side. This allows Saracens to kick to touch inside the Quins half which also sees Sinckler and Gray being replaced by Collier and Ward. Quins are penalised in the line out for interfering and Saracens elect to take the three points as Lozowski is successful with yet another kick and with a couple of minutes remaining it is game over for Quins, or is it? With a last throw of the dice Marcus Smith breaks down the left-hand side, passes out to Visser who in turn passes back to Smith who is eventually forced in to touch 10 metres from the Saracens line. Final score Saracens 24 Quins 11. Typical Quins performance, lots of endeavour, lots of chances but always seem to fail at the crucial time. Apart from the two very soft trys I thought that the defence held up pretty well. Really good performances from Joe Marchant and Marcus Smith and Clifford and Luamanu really made a difference when they came onto the pitch. Not sure that Itoje was my Man Of The Match, Alex Lozowski for me, and as for 55329 at the ground, really? I vowed a few years ago that I would never attend another match at Wembley so I can now add The London Stadium. I am totally convinced that the vast majority of those attending had next to no interest in rugby and I am in no way convinced that these matched attract the hordes of converts that we are led to believe. When you hear the continuous chatter around the stadium, the continuous Mexican waves and the prompts on the big screen or the announcer to “Make Some Noise” you know it is an uphill struggle. Edited 2 time(s). Last edit at 2018:04:30:12:44:08 by DOK. 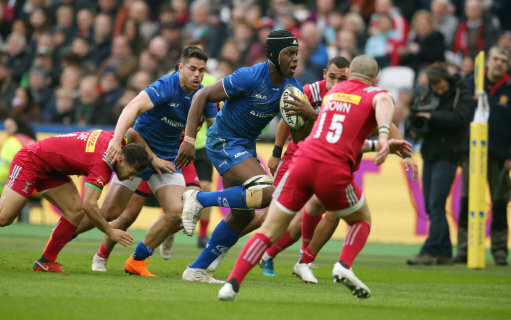 Yet again, thanks for a good write up of a bad game (from Quins' perspective). It's another one you've taken for the team....are you related to Cameron Bancroft? Thanks Greg, hope we can look forward to another of your amusing write ups before the end of the season. Good write up, thankfully I didn't attend the match but have yet to hear anything positive about the day. Hopefully Saracens play to the fixture list for this in the future and don't dictate that it must always be Quins.